MEDICAL GRADE QUALITY - Highest medical grade hypoallergenic silicone - Will not stretch in time. 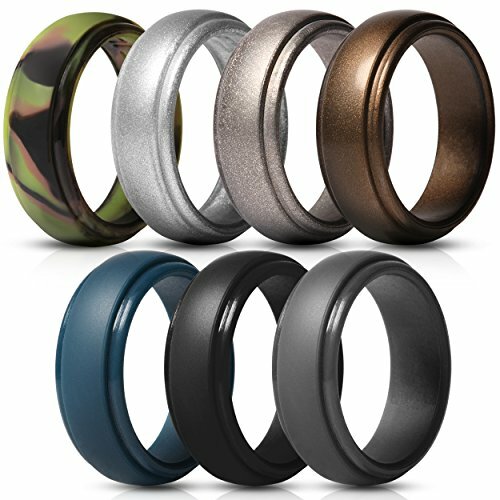 To keep your ring finger safe from jamming, pinching, or catching, our wedding bands designed to brake away if extreme pressure is applied. GIFT IDEA - The perfect gift idea for father's day, anniversary, birthday, weddings and more. This 7-Pack series comes in different colors to match any of your daily apparel and any skin stone. If you have any questions about this product by Saco Band, contact us by completing and submitting the form below. If you are looking for a specif part number, please include it with your message.